Eating seasonal and local are values I always emphasise upon. The world over, food patterns, food choices and food availability are typical indicators of seasonality. The stress on eating seasonal and local is not just to support the food ecosystem and our food sources (which of course is paramount), but simply because it’s a healthier lifestyle. Ayurveda ascribes a healthy balance of mind and body to seasonal choice of food. When you eat local, you are automatically eating what’s in season and hence working with the cycles of nature. As we start moving on from winter into spring time or Kapha season, changing weather patterns can disturb the body’s immunity and digestion. - Switch to lighter foods that are nutritious yet easy to digest. Fresh fruits and sprouts are good options. - Supplement your diet with exercise. Nothing substitutes a work out or any form of physical activity for a fit mind and body. - Raw turmeric is available in abundance at this time. Try a jhatpat kachumber with a simple seasoning or a kachchi Haldi ki subji. Turmeric has garam taseer and hence is a boon in this season. It’s also blessed with excellent anti-bacterial, anti-oxidant and anti-inflammatory properties. - Same goes for Jaggery which plays an important part during Sankranti, but is also naturally nutritious. Its rich iron content fortifies and keeps the body warm. 1. Dry roast the murmuras in a pan till crisp. 2. In a pan, add jaggery and water, mix till dissolved. Let simmer and cook until it reaches a 2 string consistency. 3. Add cardamom powder into melted jaggery and mix well. 4. Now add almonds, pistachios and murmuras into it and mix well. 5. Turn off the flame. Allow it to cool for 1 minute but not more than that. 6. 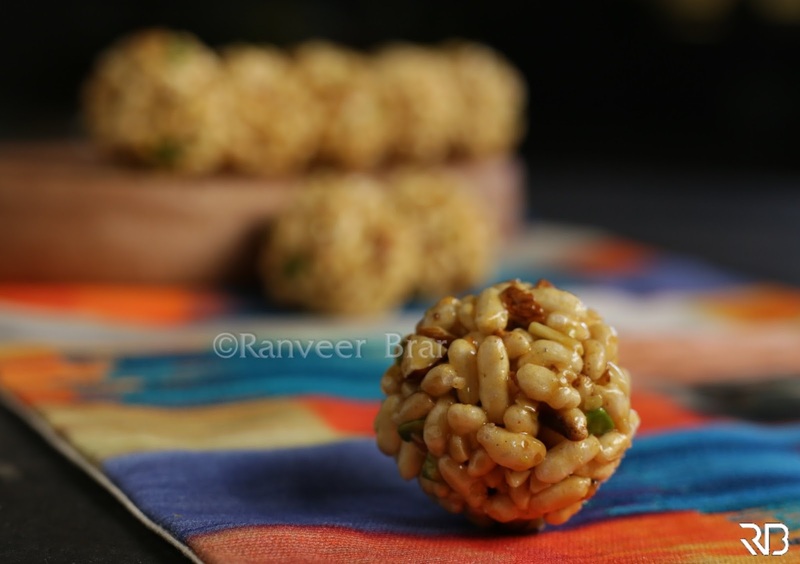 Wet your hands, take a handful of the mixture and shape into a laddoo. Repeat with the rest of the mixture. 7. Make laddoos of desired size and allow them to cool down, they will harden. Store the prepared laddoos in air tight containers. When talking about seasonal and local ingredients we can't miss on the Japanese philosophy of Kaiseki. The philosophy is world wide accepted and has influenced many chefs around the world. The use of seasonal and local ingredients used by the kaiseki chefs are on another level, not just because it is healthy but an art worth exploring. It's my favorite homemade food. Murmura laddoo (murir moya, as we call it in Bengali) is our all season happy munching. Not only in our homes but we also pack these for our relatives (specially grandparents) travelling and staying abroad.